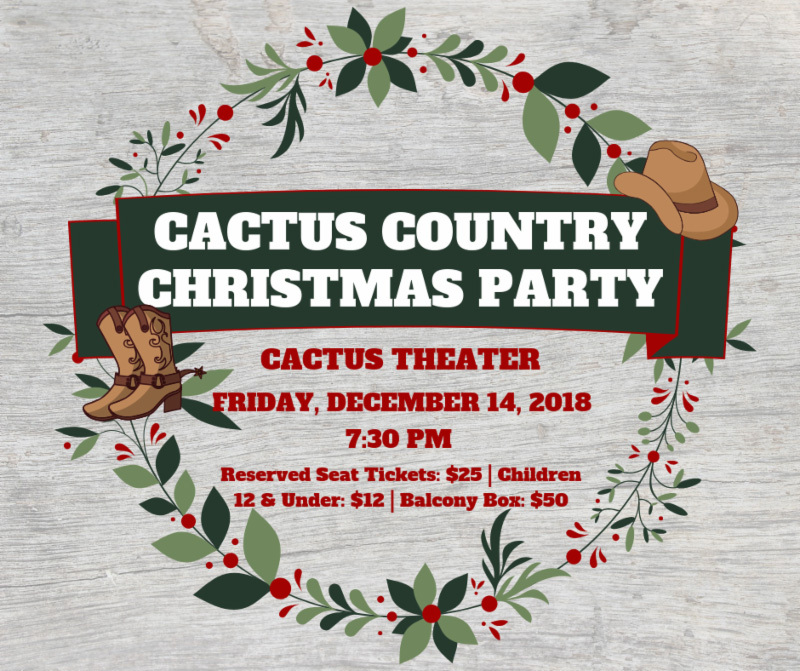 Over the years Caldwell Entertainment has produced the Cactus Family Christmas Celebrations and is excited to be back at the beautiful newly renovated Cactus Theater after its absence for two Christmas seasons. In addition to the Family Christmas Celebrations, we will produce a one night only Country Christmas Music showcase this year. Along with many of your favorite performers, this show will introduce an array of new talented country artists performing Christmas song arrangements by legendary and current country music stars. From Kenny and Dolly to Lady Antebellum, you’ll hear some of the coolest performances of country hit Christmas music arrangements ever! The show will feature emcees Kurt Kiser and Jane Prince Jones, along with Cactus stars Jeff Bailey, Kenny Maines, Terri Caldwell, Avery Guyear, Blaire Elbert, Haley Simpson, Holly Ave., Baby Jade with newcomers Brenn Edwards, Emily George, Sonny Flores, Gabriella Flores, Pete Cruz, TexWestUs singers Corbin Burgett and Chloé Fowler and the Caldwell Collective band. Ring in the Christmas spirit of love, “Country Style” at the Cactus Theater!!! Presented by Cactus Theater and Caldwell Entertainment. Reserved floor and standard balcony tickets $25 for adults; discounted tickets available at $12 for children 12 and under. Limited balcony box seats $50 (includes concessions with ticket - present box ticket at lobby counter when ordering).